I Need a Hat. Right now! And tomorrow? More of the same. But colder. And we have a photoshoot. Out. Side. I need a hat. Right now. I searched around the office for the chubbiest yarn I could find. Louisa Demmitt of the Knitscene crew graciously forked over a ball of KnitPicks The Big Cozy in Marine Heather, which she'd squirrelled away for just such a day. Sarah Read of the Crochet team added a ball in Cobblestone Heather. I found a Denise Crochet Hook Set, which of course had the size N/15 (10 mm) I needed. With a copy of the All You Need to Crochet a Hat Kit at hand, I crocheted up the Papa Bear Hat. In half an hour. That's right. Half an hour from a ball of yarn to a crocheted hat. Tomorrow, I'll be out on the streets on Denver in predicted highs of 20 or so. Parts of me may be cold. But not my head. Don't go 'round with a cold head. 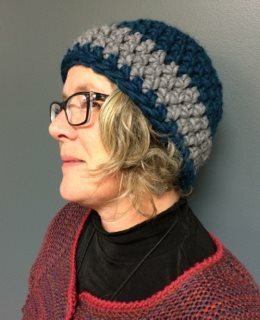 Get your All You Need to Crochet a Hat Kit. Right now. Crochet. Be happy. Be warm.